In the wake of the devastating California fires, the massive debris field – formerly neighborhoods, homes and businesses – is now a toxic environmental brew that poses risks to cleanup and recovery workers and residents alike. Kirk Johnson discusses the environmental and health risks of the California fire cleanup in an article in the New York Times. “In modern times this has got be an unprecedented event, and a major hazard for the public and for property owners,” said Dr. Alan Lockwood, a retired neurologist who has written widely about public health. He said an apt comparison might be the environmental cleanup after the terrorist attacks of Sept. 11, 2001, in New York, as debris and dust swirled through Lower Manhattan. As could well happen too in California, Dr. Lockwood said, the health and environmental effects were felt long after the attack, in the chemicals or pollutants workers and responders at the site, and the public at large, may been exposed to as the cleanup went on. California’s Department of Industrial Relations has tools, guidance and resources on workplace hazards for cleanup and restoration workers. The scope of the fire disaster in California is hard to comprehend: Photos Capture Apocalyptic Aftermath Of California Wildfires. Also: and the Los Angeles Times Mapping the destruction from California’s wine country fires. We’d be remiss if we didn’t offer a tribute to the 9,000+ hard-working firefighters on the front lines who risked life and limb to contain the fires, rescue people and save property. See NPR’s story by Eric Westervelt: In Northern California, Exhausted Firefighters Push Themselves ‘To The Limits’. See the Atlantic‘s In Focus for a display of photos that document the danger and the destruction. 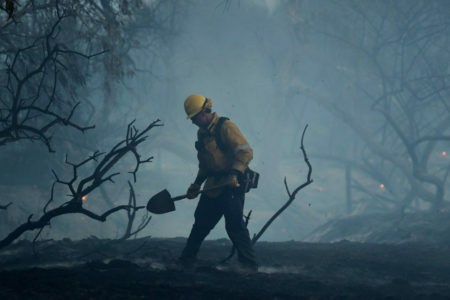 One interesting and little known aspect of the battle against the fires is that 30-40% of the firefighters battling the fires were prisoners, according to Mother Jones. About 4,000 low-risk prisoners save the state about $80 million a year. Inmates are volunteers who are trained in a four-week program, receive $2 an hour and earn a 2-day sentence reduction for every day served. Typically, they are low-risk felons. Combustible Dust: the culprit in Omaha’s explosion? When we first heard about the terrible explosion at the International Nutrition animal feed plant in Omaha, Nebraska that claimed two lives and injured many others this week, we had one thought: Combustible dust. There are many sources of ignition – fire, friction, arc flash, hot surfaces and electrostatic discharge. It’s an exposure in many industries: food production, metal processing, wood products chemical, manufacturing, rubber & plastics, coal-fired power plants, to name a few. Yesterday, Celeste Monforton of The Pump Handle reported that “OSHA and other investigators suspect that an explosion of combustible dust played some role in the disaster.” Her post recounts the OSHA and the Obama administration’s failure to take action on passing a combustible dust standard. In the wake of the Imperial Sugar disaster which killed 14 workers and injured 36, the Chemical Safety Board has produced many reports on combustible dust explosions, including the excellent safety video below. We also found this short video by FM Global to be compelling. “Did you know that dust can explode? That is to say any organic material–wood, paper, rubber, fiber, food, tobacco, etc.–can create dust given the right conditions. In this controlled demonstration at FM Global’s one–of-a-kind Research Campus in West Glocester, RI, the five ingredients needed to cause dust to explode–air, fuel, heat, suspension and confinement–are provided to cause the explosion, or more appropriately, a partial volume deflagration. Here, one hard hat full (11 lbs. or 5 kg.) of coal dust is placed in a trough approximately 2/3 of the height of the enclosure, which measures 10 ft. wide x 12 ft. deep x 15 ft. high. A small charge was then introduced to disturb and suspend the dust followed by an ignition source (bottle rocket). Although you may not be able to totally eliminate combustible dust from your process or your facility, there are prevention measures you can take to reduce the frequency of dust fires and explosions. Likewise, control measures can reduce the severity of a fire or explosion. Together, these can help you reduce the likelihood of property damage and business interruption. Find out more about this test in an article Dust to Ashes (PDF) in FM Global’s Reason, page 38. Preliminary reports for 2012 show that there were 82 firefighter fatalities, the fourth consecutive year in which fatalities were 91 or under, in contrast with the decade prior when fatalities were all in triple digits. And in one of those years, 2007, 9 firefighter deaths occurred on June 18 in a warehouse in Charleston, South Carolina. The National Fallen Firefighters Foundation has recently released a documentary on that fire, which looks at the dramatic changes made in the operations of Charleston’s Fire Department following those deaths. It’s good to hear the courage of this department at looking at and embracing the changes that needed to be made to heighten firefighter safety. Related to the idea of challenging traditional ways of doing things to improve safety, read how flashover research could change the future of firefighting tactics. A recent series of tests were conducted Spartanburg, SC to study various suppression methods for ventilating and isolating fires to prevent — or at least delay — flashover. The research shows that by “listening to the fires,” certain traditional firefighting tactics have come under scrutiny. In addition to homes being constructed closer together, they include more plastic and chemical elements, allowing fires to spread more rapidly. On the other hand, advances in windows and doors help to create ventilation-limited fires. This may mean more water on the fire sooner and waiting to open doors or windows to enter the building until a strategy is deployed. Even the old shibboleth about not using water on smoke is coming under scrutiny. We’ve previously posted about the death of chemical research assistant Sheri Sangji, who was killed as a result of a 2008 UCLA laboratory fire. She was working with a dangerous chemical that ignited when exposed to air. Her terrible burns proved fatal some 18 days after the accident. After numerous investigations, UCLA chemistry professor Patrick Harran (her supervisor) and the UC Board of Regents faced felony charges for three counts each of willfully violating occupational health and safety standards. These charges sent shock waves through university labs throughout the country since this was the first time that a U.S. professor ever faced a felony charge in relation to the death of a lab worker. Last week, felony charges were dropped against UC regents after a plea deal in which the University agreed to implement a comprehensive safety program and to establish a $500,000 scholarship in Sangji’s name. The University will provide enhanced safety training and protective equipment across all its campuses. Professor Patrick Harran’s case was continued until September to allow his defense to prepare a challenge to the credibility of the chief California OSH investigator. As the LA Times puts it, “Proceedings against a UCLA chemistry professor in the death of a lab worker take a strange turn when the defense alleges state investigator committed murder as a teen.” It’s a pretty bizarre development, one that is under much discussion in the scientific community. See Facing felony charges in lab death of Sheri Sangji, UCLA settles, Harran stretches credulity. For ongoing developments in this case, we point you to the ongoing blog postings — 42 as of today — of Chemjobber on the Sheri Sangji case. Not only does Chemjobber provide excellent informed commentary and links to a variety of sources, his postings also include interesting comments from others in the scientific community, from both private industry and university labs. Below, a good video that the Chemical Safety Board issued in response to this and other two other tragic accidents that occurred in university labs. Ironically, when we first learned about potential trouble with a three-decker fire in Worcester last week, we were in the process of gathering links about a recent NFPA report showing that firefighter injuries are down eight percent from 2009; in addition, we had come upon another Arizona study that showed that more firefighters are injured while engaged in training and exercise than in fighting fires. We were tracking NFPA stats on injuries by type of duty and by nature of injury. But then we heard about the new tragedy in Worcester where 17-year veteran firefighter John Davies lost his life in a three alarm fire. He and his partner were searching the tenement’s third floor for possible trapped people when a wall collapsed on Davies. His partner Brian Carroll fell through to the basement, and was subsequently rescued, surviving his injuries. Subsequent news reports of the fire say that no body has been found in the rubble. The resident that was reported missing is still missing, and authorities are searching for that person as a witness. Unsurprisingly, the home that burnt had 30 code violations and the owner is facing charges. A firefighter death is a difficult and tragic event whenever and where ever they occur. About 100 firefighters die in the line of duty each year. FEMA notes that “Although the number of firefighter fatalities has steadily decreased over the past 20 years, the incidence of firefighter fatalities per 100,000 incidents has actually risen. Despite a downward dip in the early 1990’s, the level of firefighter fatalities is back up to the same levels experienced in the 1980’s.” In 2011 to date, 83 firefighters have died in the line of duty. The death of firefighter Davies is a particularly difficult loss. He was to be married on New Year’s Eve. He was the father of three sons, one of whom is returning from an Afghanistan deployment to attend his Dad’s funeral. But occurring as it did in December, a few short days after the 12-year anniversary of the Worcester Cold Storage building fire that killed six firefighters, this is a particularly painful loss for the Worcester firefighting community. This grievous loss is still fresh in the minds of many locals. Both Davies and his partner were among the firefighters that responded to that fire. Both Davies and his partner were stationed at Franklin Street Station, a new station and memorial which was built at the site of the former Cold Storage warehouse. Funeral ceremonies for John Davies are scheduled for this Thursday. It is being reported that as many as 12,000 firefighters from across the country are expected. Firefighting may indeed be getting safer overall, but this week, statistics pale in the face of gritty reality. As long as people are trapped in burning buildings, firefighters like John Davies will be losing their lives. And as insignificant a response as it is, we thank them. We’re just a few short months away from the 100-year anniversary of one of the most horrific industrial tragedies in our nation, one that catapulted the issue of worker safety to the forefront and helped to usher in a new era reform, including the protection afforded by workers compensation programs. On March 21, 1911, The Triangle Factory Fire killed 146 women and girls, most of whom were trapped on an upper floor of the factory. They were unable to get out because the doors had been locked to prevent theft. You can read many first-person accounts of the tragedy at the link above. My colleague wrote about it in his post The Original “No Exit” : The Triangle Shirt Waist Factory Fire. In the wake of this tragedy, many safety laws were enacted and many lessons were learned. Or were they? Last week, the tragedy was mirrored in a Bangladesh garment shop fire that killed 29 women workers and injured another 100. It’s feared that more bodies will turn up. Reports say that to prevent theft, emergency exits were locked. It’s not just The Gap. Other companies that are supplied by Bangladesh garment factories include Wal-Mart, Tesco, H&M, Zara, Carrefour, Gap, Metro, JCPenney, Marks & Spencer, Kohl’s, Levi Strauss and Tommy Hilfiger. Surely, American companies could join forces in leveraging their buying power to demand that safety and basic human rights are enforced. Unfortunately, here in the U.S., we aren’t immune to such abuses, either. In 1991, 25 poultry workers were killed in a Hamlet chicken processing plant in North Carolina, another instance of workers being locked in. An investigation resulted in the owners receiving a 20-year prison sentence and the company was fined the highest penalty in the history of North Carolina. One would think that U.S. employers would have learned from the Triangle and the hamlet fires, but one would be wrong. In 2004, The new York Times reported that Walmart was locking night shift employees in. Later in the same year, OSHA cited a Winn Dixie supermarket in Mobile, Alabama for similar practices. The road to good safety practices here in the US was paved with the blood of workers. It took incidents like the Triangle fire and large scale mining disasters before the US public clamored for reform. It remains to be seen whether the same types of offshore tragedies will galvanize consumer opinion enough to call for better worker protections. Most Massachusetts residents will recall how their heart sank 10 years ago upon hearing TV and radio reports of the on-the-job deaths of six firefighters in the Worcester Cold Storage fire. While firefighting is a dangerous job, this was the first time that six firefighters fatalities occurred in a building where neither a collapse nor explosion had occurred. The first two firefighters became lost in the labyrinth building and the next four were lost in trying to rescue them. Firehouse.com has a Worcester 10th Anniversary Tribute and the Telegram & Gazette have devoted a special section to the remembrance: Worcester Cold Storage and Warehouse Fire: 10 Years Later. Worcester is a community that several of us at Lynch Ryan know well – we’ve lived there and worked there. Given the nature of our work, we are no strangers to on-the-job fatalities – we’ve heard many heartbreaking stories about work-related deaths that never should have happened. But rarely does an event hit so close to home and with such force as on that day. Many locals will remember the shock of hearing about two lost firefighters – shortly followed by the almost unbelievable word that the tally was now up to six. Many locals who knew firefighters as friends, family, or neighbors waited the long, tense vigil until names of the deceased were released, and then again waited mournfully until fellow firefighters were able to pull the bodies of their colleagues from the rubble a few days later. We all became familiar with the faces of bereaved spouses, children, parents, and siblings. We all saw and hurt for the heavy burden of grief that the fellow firefighters labored under. There was an amazing tribute for the fallen firefighters: fifteen-thousand firefighters from around the globe came for the memorial service. President Clinton and Vice President Gore spoke at the service, along with local Senators Kennedy and Kerry. Senator Ted Kennedy, a man who was no stranger to tragedy, encapsulated things by saying that “Sometimes life breaks your heart.” It was fitting that Kennedy was at the ceremony for the fallen firefighters, he fought for worker safety throughout his career. In the aftermath of the tragedy, Two major reports were issued: the U.S, Fire Administration’s Abandoned Cold Storage Warehouse Multi-Firefighter Fatality Fire and a report from NIOSH. Firefighter safety still has a long way to go. Tragically, two and a half years ago, nine firefighters lost their lives in Charleston SC. The fire was in a furniture showroom and warehouse – and again, a labyrinth building where firefighters became disoriented. Firefighters continue to study and learn from the hard lessons of these warehouse fires. In 2001, Firefighters in Jersey City battled a warehouse fire with similar conditions to the Worcester blaze. Fire authorities credit a seminar that they took with members of the Worcester Fire Department for guiding their strategy in fighting this fire and preventing loss of life. In addition, many communities have been more vigilant about monitoring large vacant properties, and firefighter communication technologies have been improved. The matter of firefighter disorientation is still an issue of concern and one that is under study. (See: U.S. Firefighter Disorientation Study). This has given impetus to other safety initiatives, such as advances in First Responder Locator Systems. These include a system developed at a local university, Worcester Polytechnic Institute, where engineers are nearing completion of a First Responder Locator System. Nancy Germond is hosting Cavalcade of Risk #93 – check it out. And while you’re at it, check out Nancy’s regular insurance column on AllBusiness. Mark Wall’s excellent WC forum on LinkedIn – While recently attending the National Workers Compensation & Disability Conference in Chicago, I had the opportunity to meet Mark Walls who is the founder of LinkedIn’s excellent Workers’ Compensation Forum. Mark, who is a genuinely nice person as well as a commensurate professional, has created an impressive network of more than 2,400 members, which includes employers, claims adjusters, insurance carriers, third party administrators (TPAs), brokers, attorneys, risk managers, regulators, EH&S professionals, and vendors that provide service to the workers’ comp industry. The group illustrates some of the best advantages and features of social media: industry networking, active discussion boards, and news feeds to blogs and alternative media sources. Members can pose questions or topics and get feedback from other members. Plus, Mark does a great job of ensuring that posts are on-topic and he is strict about disallowing spam. 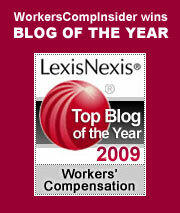 To join, you need to first be a member of LinkedIn, and then you can register to join the Workers’ Compensation Forum. Hope to see you there! The soft market and AIG – if you are wondering why the soft workers comp market persists, read Joe Paduda’s post on the implications of AIG’s price cutting – it certainly offers some clues. Of course, AIG’s pricing isn’t the only factor, but when you have an elephant in the room, it certainly can’t be ignored. Fraud surveillance – Roberto Ceniceros talks about cuts in fraud surveillance in both the public and the private sector. He’s looking for feedback from others who are experiencing a similar trend. We’ve also heard talk about cuts in safety and loss control services offered by insurers as part of work comp policies. Any feedback on these issues? It would seem shortsighted to relax on either of these important services. Feeling risky? Cavalcade of Risk #89 is posted at David Williams’ Health Business Blog. David is a master of the brief synopsis making it a very user-friendly compilation to browse. Fire Prevention – We’re right in the middle of Fire Prevention Week, a good time to communicate with your employees about fire safety at work as well as at home. Economy and workers comp – At Comp Time, Roberto Ceniceros looks at the issue of how continuing job losses could hammer comp. He notes that, “Comp researchers have referred to recessions and the accompanying fear of job loss as having a ‘disciplining effect’ on workers, which leads to fewer claims filed. But that effect may only last so long.” And for another perspective on where we are headed, at Managed Care Matters, Joe Paduda reports from the AmComp conference, predicting that workers comp results are going to get worse – he points to medical costs as the culprit. And for more on this topic, see How the Great Recession is Changing the American Workplace, an article in Insurance Journal by Jay Reeves and Christopher Leonard. The authors look at effects that are likely to be long lasting. Traumatic brain injuries – Military medicine practiced in response to war injuries has always been a proving ground for medical advances and the Iraq war has been true to form. The L.A. Times features an excellent article on what we are learning from the battlefield about treating traumatic brain injuries. Many of the symptoms of PTSD can mimic the symptoms of traumatic brain injury, which can be better identified with new diagnostic imaging technologies. Friction reducing devices – On the MEMIC Safety Blog, Lauren Caulfield talks about friction reducing devices aka “slider sheets” as a way to reduce injuries in healthcare settings when repositioning and turning patients. Legal matters – In the Wall Street Journal, Cari Tuna talks about the rise in employer retaliation claims, which were up by 23% in 2008, according to the Equal Employment Opportunity Commission. The article quotes one employment law attorney who puts retaliation as the No. 1 risk for employers today. Jeffrey Hirsch at Workplace Prof Blog says part of the reason is something akin to the principle it’s not the crime, it’s the cover up. Every picture tells a story – We’ve previously pointed to the Naval Safety Center’s Photo of the Week. hair-raising photos of unsafe work practices. The Safety Duck Quacks also has a collection of photos of unsafe work situations. So You Think Your E-Mail Is Really Deleted?